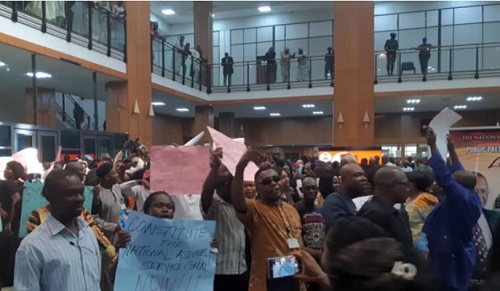 Some workers under the umbrella of Parliamentary Staff Association of Nigeria (PASAN), on Tuesday blocked the entrance of both chambers of the National Assembly, and vowed not to back down until they received notification of payment. Sani Omolori is the clerk of the assembly. 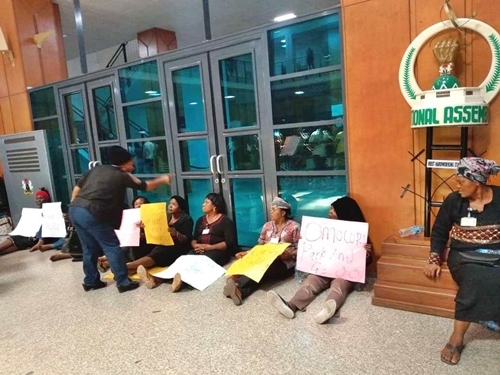 Musa, who addressed journalists saying that lawmakers would not be prevented from accessing the Red and the Green chambers when they arrive, stated that the workers were not in a faceoff with lawmakers. He said, “The word ‘picketing’ does not prevent anybody from working, it is a message passed to the leadership of the National Assembly. And don’t forget, it is for a duration of between 9am and 2pm. Then, after that, everyone will return to work. “We have not asked anybody not to go to their offices. What we had at the back of our minds when we set out was that when they come around, they will definitely find out what is happening, because we have written to them almost eight months ago and nothing seems to be happening. "You will agree with me that they are almost on their way out and this is the best time for us to cry out loud because the whole world will know why we are embarking on this peaceful demonstration." The PASAN leader said the workers were ready for negotiations with the National Assembly management.